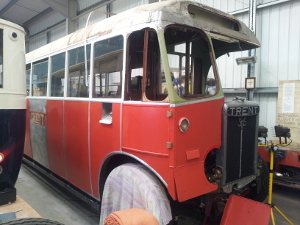 Built by the Birmingham & Midland Motor Omnibus Company (also known as Midland Red) for fellow BET (British Electric Traction) Group Company, Trent, whose operations were then based mainly around Derby. In common with many pre-war SOS single deckers, the body was built by Brush of Loughborough. It has been suggested, but never proved conclusively, that the initials 'SOS' stood for 'Shires' Own Specification' - the company's then Chief Engineer being Mr L.G. Wyndham Shire. 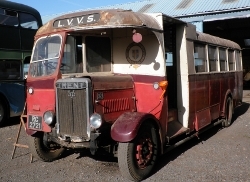 The SOS ON model was introduced in 1934, when the maximum length of single deck buses was increased to 27 ft 6. Early ONs were powered by the SOS petrol engine. 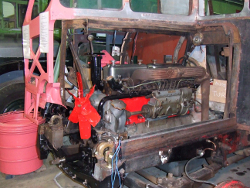 As the demand for diesel engined buses grew, the diesel version of the ON - DON - was introduced, using the AEC 7.7 litre indirect injection engine. SOS developed their own diesel engine in the late 30s, which was fitted to the later SON model. 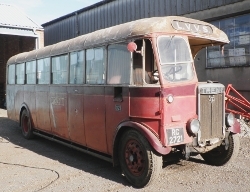 Midland Red continued to construct their own buses until the late 1960s, although no longer under the SOS classification. A photo of similar No. 304 in service can be seen on the SCT61 Website. 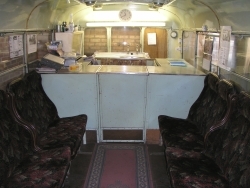 Withdrawal from passenger service came in the 1950's when 321 was converted for use as a booking / enquiry office and waiting room for use at Skegness - this involved widening the doorway, removing seats, and constructing an enquiry counter. At that time, Trent operated a year-round limited stop service from Derbyshire to the Lincolnshire Coast - augmented by many extra services in the summer season, giving many small villages a direct service to the Coast. Initially, the bus was driven back to Derby for the winter season, although in later years, it was towed. The 'SOS' in London, probably on its way to or from the London - Brighton Rally. Trent's enquiry counter, during the SOS's spell as mess room. 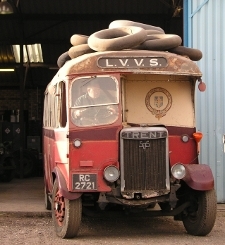 The seats are not original to this vehicle, the original seats having been removed by Trent upon conversion. 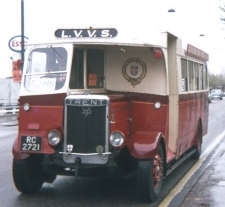 Passing to the LVVS in 1965, the bus was used as the Society's support / tender vehicle, and rallied for a number of years. Having been off the road since the early 70's, 'The SOS' in recent years served the LVVS well as a static canteen / mess room, using Trent's counter, now for the service of tea rather than timetables! The bus was not obvious to visitors to our workshop, being partly hidden behind storage racking. January 2010 - A start has been made to smarten up this long standing member of the collection which has been laid up in the workshop for many years now, in use as the members 'tearoom'. 321 started very easily in October and drove out of its resting place without fuss to be given a wash (badly needed!) 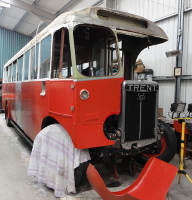 After the open day the paint was stripped from the lower offside with some panels being removed around the cab area to repair a bent wing and some waist-rail wood rot. It's not too bad but we do require a person with a chisel and a saw to lend a hand with this bit please. We will also have a sponsorship drive shortly to see if we can get some support for this unique bus. Wouldn't it be great if it could turn up at our Lincoln Castle rally in June as our 'Control Vehicle'!! Being driven into the outdoors for the first time in over 15 years, October 2009. The offside on view for the first time in 15 years, after a clean. Offside panelling removed, November 2009. 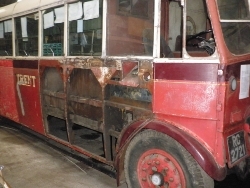 April 2010 - The fuel system has been serviced so that the bus can run as designed i.e. we can dispense with the temporary fuel line and funnel! This will be a great help when repositioning the bus in the new building so that more work can continue soon. The fuel filter and tap were 'discovered' behind the bulkhead paneling which was fitted for its use as a booking office with Trent Motor Traction at 'Skeggy'. Originally there was an interior access panel for these! A new 'substantial' flexible fuel pipe is now fitted. Meanwhile the paint stripping is continuing on the lower panels. We still could do with a bit of help to sort out some wood rot near the cab though! 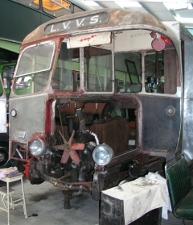 July 2010 - Work has continued with the paint stripping on the body - Assistance is still needed with a few wood framing defects to be sorted - any offers please? October 2010 - The paint stripping exercise is going very well and the interior has been tidied up recently. All five hydraulic brake cylinders have also been removed for inspection. January 2011- The brake cylinders have now all been professionally overhauled and new copper brake pipes made up. The off side interior panels have been stripped out so that the rotten framework can be tackled - this should start early in the new year - while the paint stripping exercise continues. The front wings are also being repaired. April 2011 - The rotten wood behind the cab has been replaced, the radiator removed for repair and stripped down, all the wheel hubs stripped and checked over and new brake linings fitted throughout with the brake system now bled. More paint has been stripped off the body and the chassis cleaning is progressing. The bonnet and front wings have been welded as necessary and shot blasted and painted. The front interior bulkhead panelling has been removed to reveal the original window frames. July 2011 - A thorough clean of the front end of the chassis is underway, unearthing such things as a plate on the gearbox advising that the gearbox came out of 311, and details of the overhaul too! Two new windows have been fitted, and the cab is being cleaned and painted. Lots to do here! The radiator bottom tank has been bead blasted, then welded and will be fitted with new gaskets to the main section soon. Thoughts are now with the purchase of a set of tyres, when funds allow. October 2011 - The radiator is now reassembled and looks lovely! The engine oil has been drained and the sump etc cleaned out. Two new rocker box gaskets have been fitted following the engine having a 'paint up' with the rocker boxes cleaned and polished. It too looks super now. The cab has been stripped out ready for a good clean up and paint with various other parts receiving attention such as the cab door following removal. The nearside roof frame has had some new wood spliced in - the steel dome is now being repaired as necessary. All the tyres have been removed from the wheels, these being shot blasted and primed. January 2012 - All the road wheels have been under-coated and top coated and await tyres. The cab renovation continues with the fuel tank (yes the driver sits over it!) being cleaned, repaired and painted. The rear wheel arches have also been cleaned out and painted. A new steel dash panel has been cut out, painted and fitted, with many smaller items being prepared similarly. Some of the interior panels have now been reinstated. The cab seat is being cleaned up, with the frame repainted and a new cushion made. Before long the roof will have to be stripped of paint (most of the lower vehicle is now stripped) - anyone fancy giving a hand, say one Saturday to suit (?) please get in touch! The workshop is a nice environment for working in so don't let the winter put you off. April 2012 - The new tyres are now fitted and the cab renovation continues, together with the saloon interior and roof area. The front brake drums have been carefully cleaned and painted. July 2012 - New wood has been spliced in above the cab door by Eric, various parts are being cleaned and painted by Mike H, Steve L and Stuart, including the rear hubs, windscreen framing etc. October 2012 - More wood has been fitted by Eric, this time above the rear emergency door. Stuart, Mike H and Steve L are also working on the cab door and associated areas. January 2013 - Repairs to the front dome and structure continue, together with new frame work as necessary around the entrance. Several panels have been prepared for re-fitting and the cab seat has been completely reupholstered. April 2013 - More work to front end has seen the interior of the destination box being cleaned out and repainted and the light fittings renovated. The exterior drip rail above the windows has now been stripped of paint and all the window surrounds are now rubbed down. When the weather gets warmer these will be primed and undercoated. 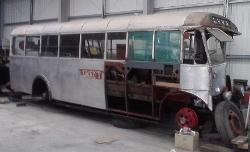 July 2013 - The rear mud flaps have now been fitted, together with all the wheels, so that the bus can be moved to a better spot for work to continue on the roof. The window surrounds and drip rail have been primed and undercoated, but some rotten waistrail framing has been uncovered and needs replacement. 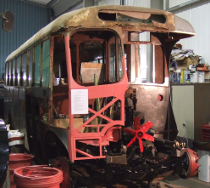 January 2014 - A section of rot has been discovered in the n/s waistrail, and a new section has been machined and fitted. More attention has been given to the preparation of the bodywork for painting, particularly at the back end. The steering wheel is also being repaired as it was poor condition under the remains of the old plastic coating. 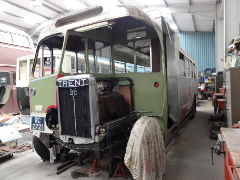 April 2014 - All the woodwork at the nearside rear frame is now in place and the panels have been refitted. The rear emergency door has been removed for repairs to the frame. July 2014 - The SOS has had new beading fitted and is now in red and white undercoat. The AEC engine now starts 'on the button' when needed. October 2014 - Progress has been made with repairing the front dome and sanding down the roof. Restoration is proving easier thanks to the bus being moved to the front of the Peart-Pilkington building. January 2015 - The roof domes are under repair; most of the roof has been primed and undercoated. The emergency door has been repaired. April 2015 - The front dome continues to take shape, having been covered in glass fibre paste to get a smooth finish. 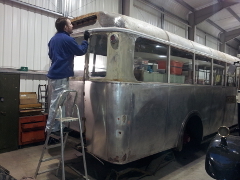 The bus has largely been painted in undercoat and the framework for the wooden roof vents completed. July 2015 - The roof ventilators have been refurbished with new wooden frames and repaired where necessary. This vehicle is currently in the Society's Workshop, and is not on regular display.